Today is New Years Day, 2013. On this day every year, people all around the world, contemplate the prior year. It is human nature to “want” to be better. No matter where we are in our lives, we honestly have a part of us that desires to be better. I am thankful for this special day! Every year I ponder and revaluate my life. What all did I do? Did I succeed? Was I active or lazy? How was my relationship with God? Can I see spiritual growth in my life? Did I reveal strong love to my husband, children, family, and friends? Each year I take a “time out” to focus on the coming year. How I can make my life a little bit better? Although I have many resolutions, one remains the same year after year, day after day, and moment and moment. Have I grown closer to God? 2. I truly desire to read my Bible every single day. Even if it’s only a paragraph, although I will aim for a chapter or more. My Bible will have it’s new home on the island in the kitchen. As a reminder to read God’s life giving words daily. 3. I will be more mindful of the time I’m spending on the iPad’s, iPhone, computer, etc. At times I feel life is passing me by, simply because I have my focus on a lit up screen. I am reminded that “life” is the most amazing screen, and I choose to spend more time enjoying God’s aesthetics and the people He’s placed in my life. 4. My body is my temple, and I choose to live a healthier lifestyle. Each year this is at the top of my list. Several times I have accomplished this goal to some extent. This year it would sure be nice, if I could top the previous years and lose a considerable amount of weight. 5. To continue serving God, and trusting Him in each situation. To make God more the center of my thoughts and heart. To respond the way God would, and love the way He loves. To become more like Christ! 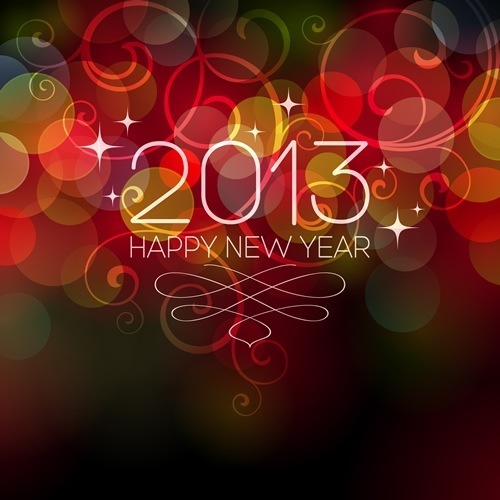 Readers, What are your thoughts on 2012, and what are your resolutions for 2013. It is my prayer that God is at the center of your heart and mind. Always remember that God loves you, and desires the very best for your lives.